Ultrasone HFI-780 review | What Hi-Fi? 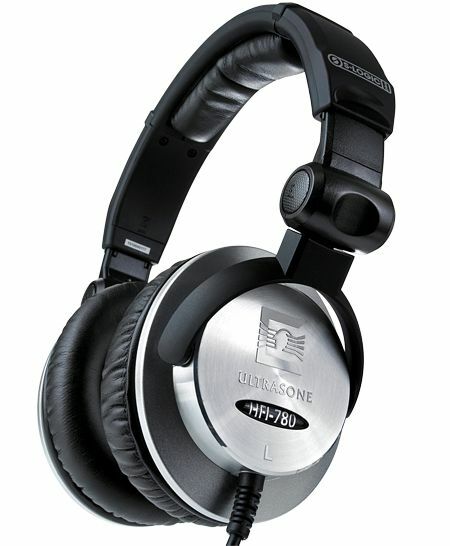 Ultrasone seems to have tried to please everyone with the HFI-780s. Among the products from the more straight-ahead, established electronics manufacturers, these are a quite ostentatious, shiny design; compared with the overtly style-conscious headphones they're fractionally staid, traditional lookers. But either way, the HFI-780s are a robust, nicely finished pair of headphones that feature big (but gratifyingly unsweaty) earcups and a comfortable headband. The fixed cable comes with a 4m extension to its 1.3m length, and is terminated with a slim 3.5mm jack. Despite the over-ear design, the 780s aren't so big that you'd be afraid to venture outdoors wearing them. Should you do so, they stay in place tenaciously. The sound they leak is negligible, and the uniform fit of the earcups means the wearer is well isolated too. In common with all the other designs here, the HFI-780s do their best work when fed a decent-quality recording. With a lossless FLAC file of Simon and Garfunkel's The Only Living Boy In New York playing, they're a peppy, up-front listen. The stereo character they take on is fairly confined, although there's decent separation of instruments upon it – and they integrate the disparate strands of the recording well, too. Low frequencies, while undeniably on the plump side, at least have the good grace to start and stop promptly; their punch and substance is welcome, but they do exert just a bit of a squeeze on the lower part of the midrange. That's a pity, because otherwise the midrange is detailed and informative, allowing the vocals full expression. At the top of the frequency range, though, treble sounds can be a little hard, and a touch of sibilance can creep in at high volumes. Playing the altogether more attacking Hong Kong Book of Kung Fu by Cornershop, the Ultrasones really charge along. They revel in up-tempo material, giving momentum and excitement to recordings without threatening to lose control. There's more than enough dynamism on display, and the HFI-780s demonstrate a real facility with transients and fine details – little escapes their attention. They're a bit less assertive with sparer, more down-tempo stuff, but overall the Ultrasones are an engaging and occasionally thrilling listen. You're not short of choice where headphones of this type, and at this sort of price, are concerned. But if you value pep and detail, don't mind a soundstage best described as 'intimate' and aren't about to feed them an exclusive diet of quiet singer-songwriter-y music, the HFI-780s are well worth consideration.